For years, starry-eyed initiates to the West’s backcountry have packed along classics like John Muir’s My First Summer in the Sierra, Edward Abbey’s Desert Solitaire, and the journals of Lewis and Clark. These writers inspire us, open our eyes to the beauty and the fragility of the rugged West, and give this landscape a mythic resonance. However, much of that myth has been written by men. “Here, in the wilderness, a man could be a real man, the rugged individual he was meant to be before civilization sapped his energy and threatened his masculinity,” writes environmental historian William Cronon, describing the ethos that’s shaped, and misshaped, our understanding of what wilderness is. Even the women writing in this tradition — Mary Austin, Terry Tempest Williams, Leslie Marmon Silko — often write about the struggle to make their way in a world dominated by men. Recently, though, women have been storming the barricades. From Cheryl Strayed’s best-selling memoir of hiking the Pacific Crest Trail to Claire Vaye Watkins’ myth-busting fable of a waterless California, many of the exciting new names in the literature of the West are women. If the traditional vision of nature is one of struggle and conquest, of man testing himself against solitude and the elements, what does this shift mean for our collective vision of the wide-open spaces of the West? HCN spoke with two rising stars in the literature of the West about what this change means for them. Blair Braverman’s dogsledding memoir Welcome to the Goddamn Ice Cube (Ecco, 2016) deliberately pushes back against some of the myths of the adventure narrative, while Emily Ruskovich’s story of family tragedy in the remote Rocky Mountains, Idaho (Random House, 2017), takes up the mantle of novelists of the rural West like Wallace Stegner and Ivan Doig. 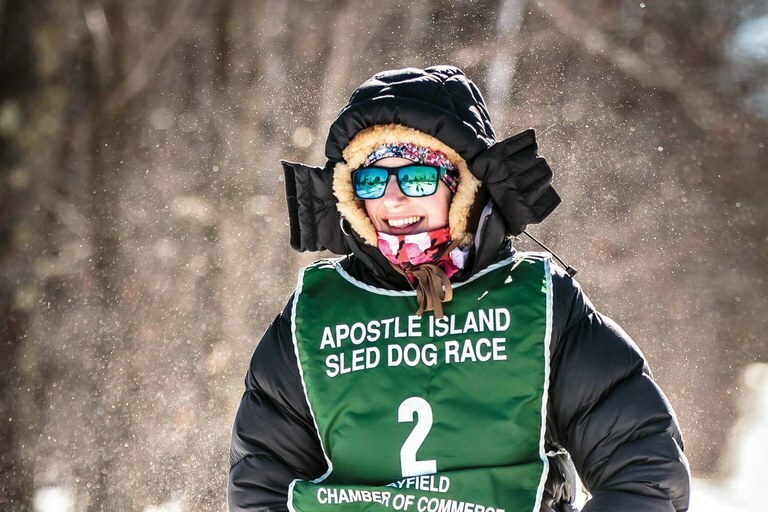 Braverman spoke with us from her home in the Northwoods of Wisconsin, where she is training for the Iditarod, and Ruskovich spoke with us from Idaho City, Idaho. She has recently joined the creative writing faculty of Boise State University. Blair Braverman races in the Apostle Island Sled Dog Race in Bayfield, Wisconsin, in February. She lives and writes in northern Wisconson and is training for the Iditarod. High Country News: How has your experience with nature and wilderness influenced your writing? Blair Braverman: My writing is very, very informed by nature — I’m always thinking about nature, wildness, the outdoors. But when I was writing Welcome to the Goddamn Ice Cube, I wasn’t thinking about the landscape so much as the human interactions that this particular landscape made possible. That was a driving question for me: What human interactions can only happen here, in this place, and nowhere else? The book is nature writing, Arctic writing, as reflected in the humans — mostly men — who live there. Emily Ruskovich: I grew up in the mountains just above Blanchard, Idaho, on 40 acres on Hoodoo Mountain. There was no electricity, no running water, no well, just badly logged land, strewn with the eerie garbage of the previous owners. We lived there through my adolescence. At first, we lived in tents, until my parents finished building our barn, and then we lived in the barn with all our animals. Every night we would eat whatever we could make on the fire. We would drive to town with empty milk jugs, fill them up with water, and haul them back to the mountain. We would boil that water on our fire, and, after it cooled a little, my mother would pour it over us to get the sticks and bugs out of our hair. That was our shower: We would stand on our picnic table and she would pour stolen water over our heads. Living up there, especially before we had a house, was one of the most incredible experiences of my life. It was an intense, wonderful time. I couldn’t have written Idaho without having lived on that mountain. It wasn’t simply formative for me; it’s actually who I am. I remember it with such clarity, and I ache for it. It’s so immediate for me, and I’m always trying to get back there by writing about it. I think of my book — even though it is a very sad story — I think of it as a love letter to my family, and to our lives up there, and to that mountain. HCN: You each have a really distinct vision of wilderness. What was it that caused you to step away from a more traditional way of writing or thinking about wilderness? BB: One of the things I love about dogsledding is how it forces me to engage with nature on a deep level. I think the Leave No Trace ethos is vital, I’m glad it exists, I practice it when I go camping — but I’m also grateful that I came of age as an outdoorsperson in northern Norway, where I was taught to build fires and improvise shelters and otherwise interact with the landscape in slightly messier ways. All of our stories about nature are shaped by the ways in which we encounter it. Leave No Trace practices teach us to pass through landscapes like ghosts, rather than become a part of those landscapes. We’re already so many steps removed from nature, and Leave No Trace is another veil of separation. I wonder how it’s going to affect the next generation of nature writers. Maybe it will push the genre in new ways. I’d love to be surprised. ER: Even though where we lived was so far removed from society — it was so far away, and very difficult to access, and very wild — wilderness for us was not untouched by people. Previous occupants of the land were always with us in the form of old garbage or treasures, some from a decade ago, some from a century ago. The most amazing thing that I found was a boot, a woman’s or child’s boot. It was filled with ants and soil and was decaying, so old that it was made with tiny nails; the lip of the boot curled over and there was lichen growing on it. All of this is to say that people’s lives, and the hardship of people’s lives, was very much a part of our life. Wilderness is not just the trees and the animals and the flowers and the danger; it was also very much about people. Imagining this other family, homesteaders from very long ago, was a part of our experience. HCN: How is women’s writing about nature and the West different from men’s writing? BB: Women are already outsiders in the genre, so there’s less pressure to fall into established tropes. In the classic tale of Man vs. Nature, either man or nature wins — which means that the other one loses. But that’s a narrow framework, and without identifying with the writers of the canon, it’s easier for female writers to sidestep the competition entirely. Take Aldo Leopold vs. Annie Dillard. Dillard is repelled by nature. She’s horrified by it, and she makes us feel horrified, too. There’s a reverence to traditional nature writing that women writers don’t adhere to as much. The best women nature writers have leverage to be less sentimental, to tell a more complicated story. HCN: Blair, how does your work push back against the standard male adventure narrative? BB: Outdoor writing falls into all sorts of gendered tropes. Men’s coming-of-age stories are about going into the world and battling dragons, so to speak. Women’s coming-of-age stories are about going into the world and discovering that it’s dangerous in new ways for them. Ice Cube, I think, is both of these, without the tidy conclusions of either. If you look at traditional stories of wilderness and survival — which is of course an adjacent genre to nature writing — we usually see men responding by taming the wild, making it civil, and women responding by going feral. After all, wild femininity is dangerous — that’s where witches come from, right? HCN: Any final thoughts on what Western landscapes mean for your work? ER: These lines from Joan Didion really touch me: “A place belongs forever to whoever claims it hardest, remembers it most obsessively, wrenches it from itself, renders it, remakes it so radically that he remakes it in his own image.” I read that over and over again when I went through a grieving period after my parents had to sell our mountain. Writing my book was a way of loving it obsessively and radically and remaking it in my own image. It’s a way of holding onto it forever even though the cable gate is now locked against me. Emily Wortman-Wunder writes from south suburban Denver, Colorado. Her work has appeared in Vela, Nimrod, Nautilus and elsewhere.